January 2012 is nearly a thing of the past. Seems just days ago we were bringing in the New Year. Okay enough... I've got both UFOs for January done. With days yet to spare...imagine that! I got this one done today. 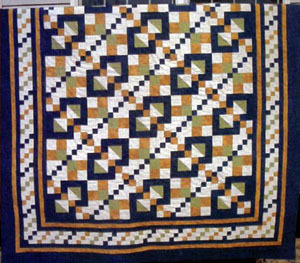 It is part of Jo's Country Junction Quilt Square Quilt Along for 2012. Not really a UFO I suppose...but it will be if I don't finish each month. Lori Smith designs these blocks. 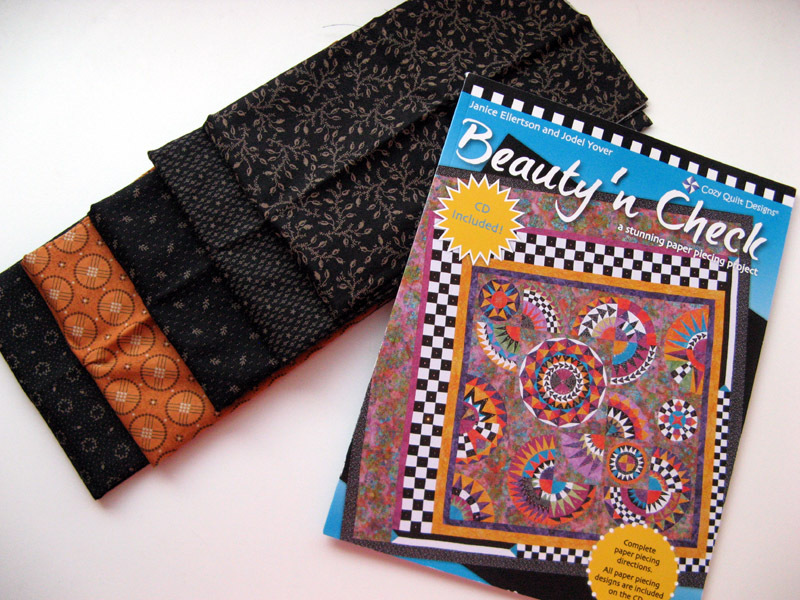 Each pattern comes with six different 12" square designs. For January we were to make the log cabin from her Quilt Squares #1 pattern. I'll be linking in tomorrow along with finding out what's next month's assignment. 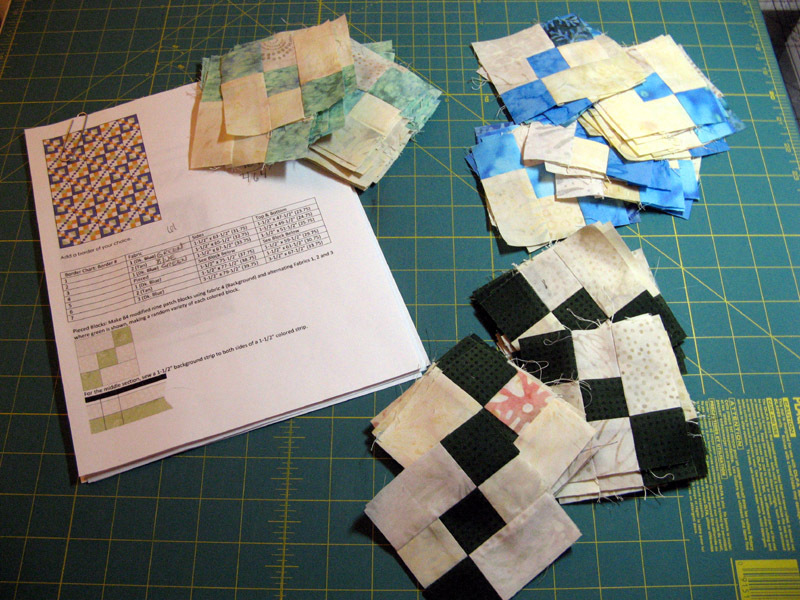 I plan to assemble all 12 blocks at the end of the year into a sampler. I also was able to finish Kindhearted Klues. This one is from a workshop I took at Road to California last weekend. Tracey Brookshier led 32 of us on through the night with Lakeside Mystery 1. The binding will be more of the stripe that I used for the inner boarder. Next up is Komplikated that happens to be a 2011 UFO that's been waiting its turn. I have all the blocks done its just waiting for assembly. Now that my January deadlines are complete this one is next. Pictures of this project will be posted later this week. Check out more fun projects through links on Patchwork Times. I've got another 2012 UFO for January to get done yet. I'll be working on this today. 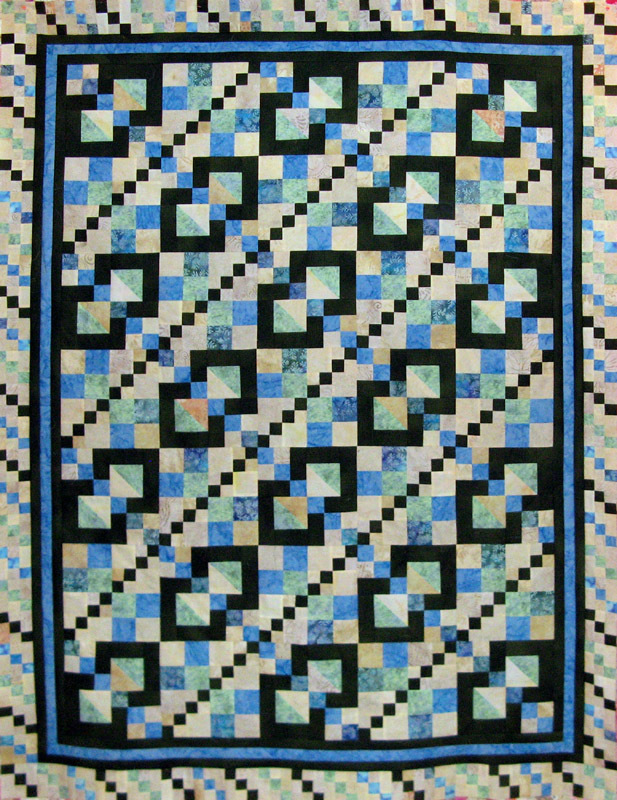 Jo's Country Junction's Challenge has us making from Quilt Squares #1 a 12" x 12" small quilt this month. 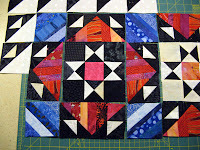 We'll be making the log cabin design and like Patchwork Times linking up on Jo's Country Junction blog. I think I'll be doing all these 12" blocks with a similar fabric theme so that they'll go together as a sampler at the end of the year. No name for this one yet. We'll see what comes to mind as the year progresses and more blocks are assembled. After this one I'll be assembling the Kindhearted Klues. 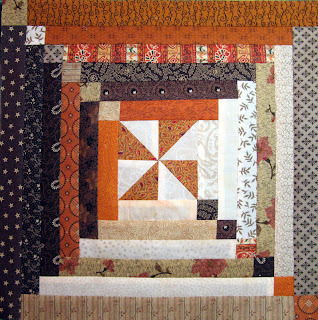 This project is from the recent Road to California Quilt Show workshop Lakeside Mystery 1 with Tracey Brookshier. Tracey's pattern is called Candy Hearts. I'm going to keep this one a mystery for you until tomorrow when I post on Design Wall Monday! 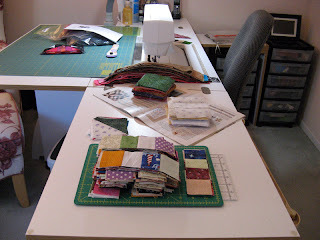 See others adding and using up their stash at Patchwork Times. This is what was finished Friday at the first workshop of the day at the Road to California Quilters' Conference and Showcase. 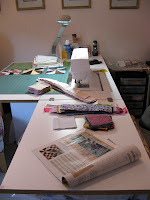 The workshop was with Karen Eckimer on her design Scrappy Layered Log Cabin. 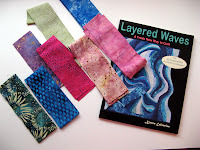 The technique is to press under a curvy side to your strip then starting with the black center layer it on top and top stitch the strip down. Cut off excess. Working in a counter clockwise direction add on the next curvy strip and repeat. Center, light, light, dark, dark then repeat with the light. These blocks have no particular size. You match them up in a row then attach them to the next row in the same press under a curvy side manner. You'll have to learn more with her pattern available in her book Layered Waves. The Lakeside Mystery 1 that was the late night workshop was held at the Doubletree until midnight. There were about 30 something attending. We had cutting before class so we were ready to sew to our hearts content. Tracy Brookshier was our instructor. She was really prepared for us with seven clues and the reveal. She sure mixed it up so none was the wiser until clue seven was passed out. I managed to get all 36 hearts done during the six hours with a little help from speedy Kerry! This project is nearly finished which makes me real happy since I've got so many other projects going on. This week I'll be focusing on two 2012 January UFO deadlines. This is Kontinuum my January UFO #5 with Patchwork Times. I have all the major blocks done. I am assembling the 84 small 9-Patches that will be part of the border right now. How's your week looking? 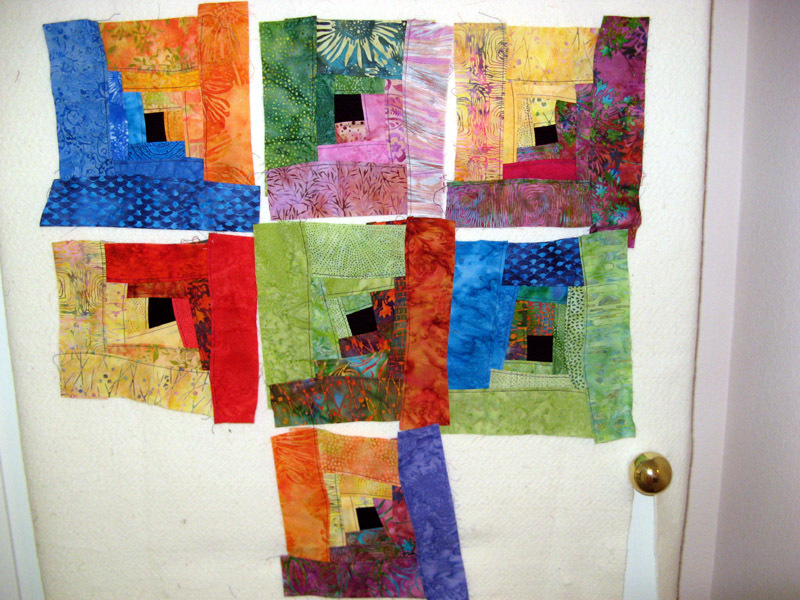 Lot's of quilters showing off their Design Walls today at Patchwork Times. Again nothing USED! But PURCHASE I did! What fun I had...of course now with less pennies in my piggy bank. The report is showing a bigger negative than last week. I'm not going to say anything about when this current trend will go in the other direction. This is just the way it is right now. 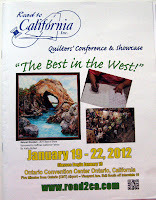 I attended the Road to California Quilters' Conference & Showcase. Kerry and I attend this together annually usually staying in the Doubletree which puts us in walking distance from the Convention Center and the location of the Mystery Workshop that finishes real late at night. Quilters Paradise in Escondido helped me with my first purchase this week. FQs and a bit of yardage for the Road to California Quilt Show workshop Lakeside Mystery 1 with Tracey Brookshier that I took on Friday night from 6pm to midnight. I had a good start from my stash for the project, just not a stripe and some additional coordinating fabrics with the start. I was real excited how these pieces worked in to the rest. The second purchase came at lunchtime the day of the workshop at the Vendor Mall on the Showroom Floor. Turns out the Mango Margarita Bali Pop didn't have enough lights in it for the Scrappy Layered Log Cabin workshop with Karen Eckmier. Kerry and I purchased a bunch of FQs and split them to keep going in the class. Both of us could have shopped in our stash, but it exactly in our reach being 1.5 hours one way away from the classroom. We also purchased Karen's book...sorry classmates I got the last one she had with her. Karen took the time to sign it too. Saturday was our Showroom Floor day that began immediately at the Koala booth. I did it! In just a few short weeks I'll be having furniture delivered that will be awesome. I decided on white (just like the picture) and wine upholstery for the chair. In the photo the base cabinet which is where the machine is located with two sets of drawers one on either side fo the chair. I also got the optional leaf and shelves that attach under it. I also got the extra 6" height. The extra height will make it kitchen counter heights so there's no bending over to cut. I'm terribly excited! I picked up a package of bobbins for the new machine too. It was getting a little silly with only two bobbins; stopping to fill them up all the time instead of having a bunch done at once. You know how fast you can get through two bobbins. 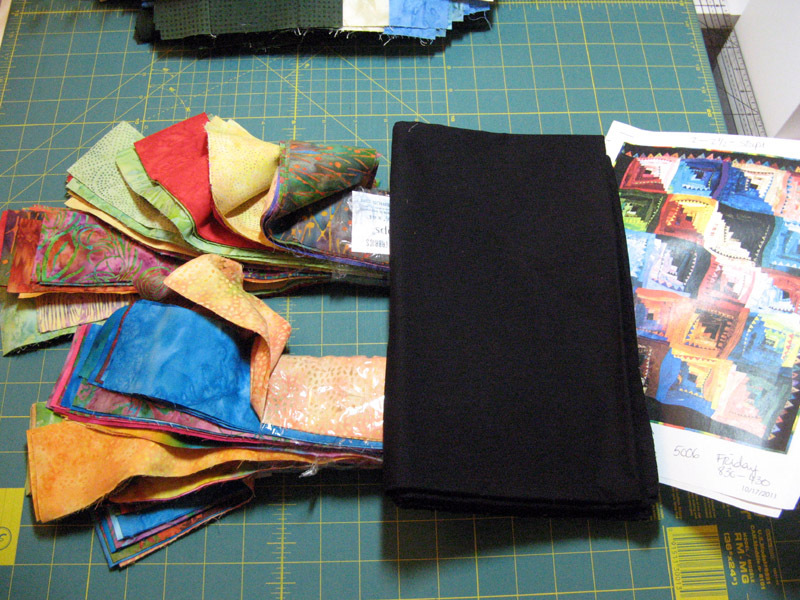 The final fabric purchase was reproduction theme blacks and a great cheddar. A pattern caught my eye that will need a bunch of small scale blacks so I'll be building my stash with them until I need a new project and I've got enough variety. The pattern is called Licorice Allsorts by The Rabbit Factory. I also picked up the book Beauty 'n Check from the Cozy booth. I've been waiting for this book for at least two years. The authors held a class at Cozy's awhile back that I really wanted to attend but timing just wasn't what would work at the time. Here's the damage! Check me out tomorrow and I'll show you what I was able to accomplish during the 12 hours of sewing in Friday's two workshops. How am I matching up to what you're doing? 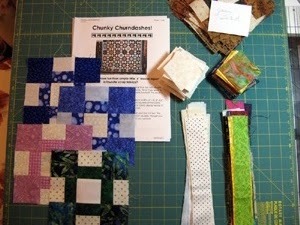 See others adding and using up their stash at Patchwork Times. Next picture is of a block swap that I've been coordinating. 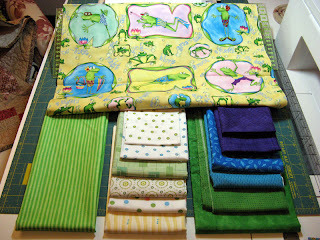 Blocks are due to me by the end of February and already I've got the blocks from Karen C, Lisa F, Joan T, and Collette M. The last stack are my blocks to swap. We are swapping Bonnie Hunter's Chunky Churndashes, 30 must be swapped giving each of us two from everyone participating. 11 more to turn in as of today but we've got lots of time yet. That's it for now. 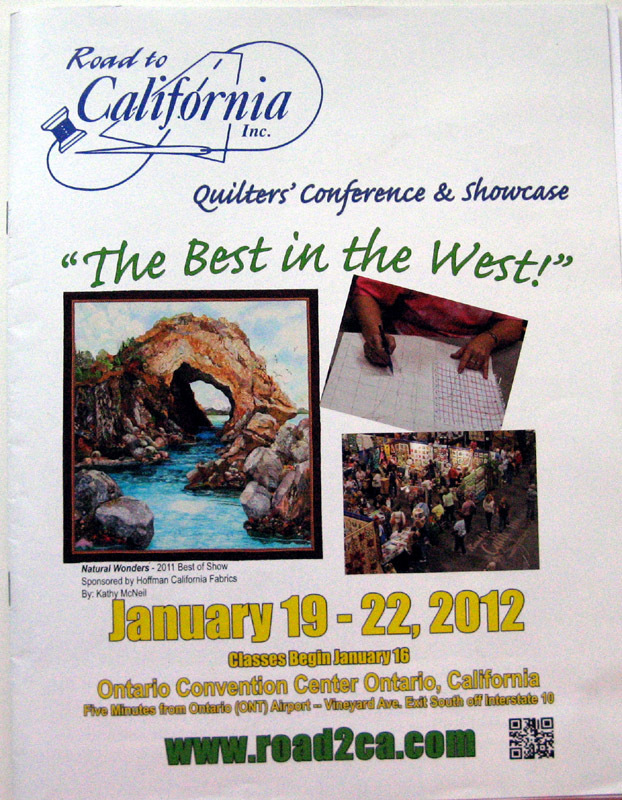 I'll be back soon to tell you about my Road to California Quilt Show adventure. 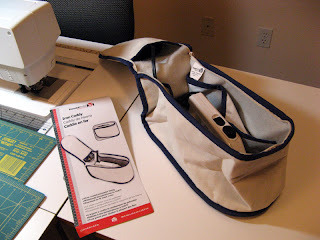 I've got several things going on in my sewing room today. Too many to put on my design wall. This is what is on my wall. 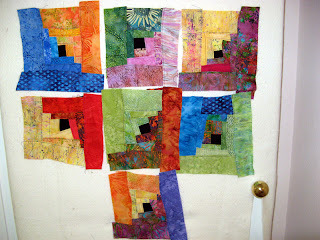 It is from a Scrappy Trips Around the World workshop I took with Bonnie Hunter at Memory Lane Quilt Shop on Wednesday. I have just six of the 20 that I'm planning on making. I've not decided on a name for this one yet, but it will go together fast once I get back to sewing it. 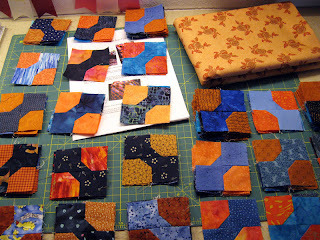 The other projects I have started and not finished include the Cheddar Bow-Ties (Bonnie Hunter) which is sewn up to my scraps of blues and oranges. 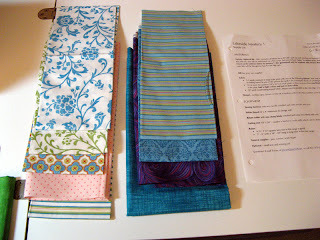 This one will be sewn as these fabrics come along OR I get to excited with it to wait! 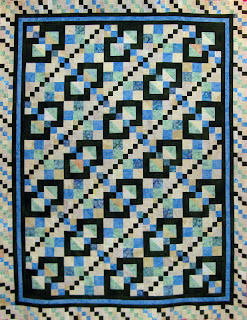 Chunky Churndashes (Bonnie Hunter) is part of a swap that I'm coordinating with 15 others. 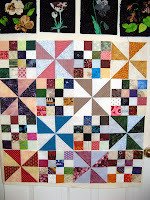 Several have turned in their swap blocks which are supposed to be to me by the end of February. There will be more on this project later in the week. Kontinuum (Judy Laquidara's Connect the Dots) is at Clue #3 which is the last of the connector block being assembled with the top's assembly as well. It also has the instructions for the borders. 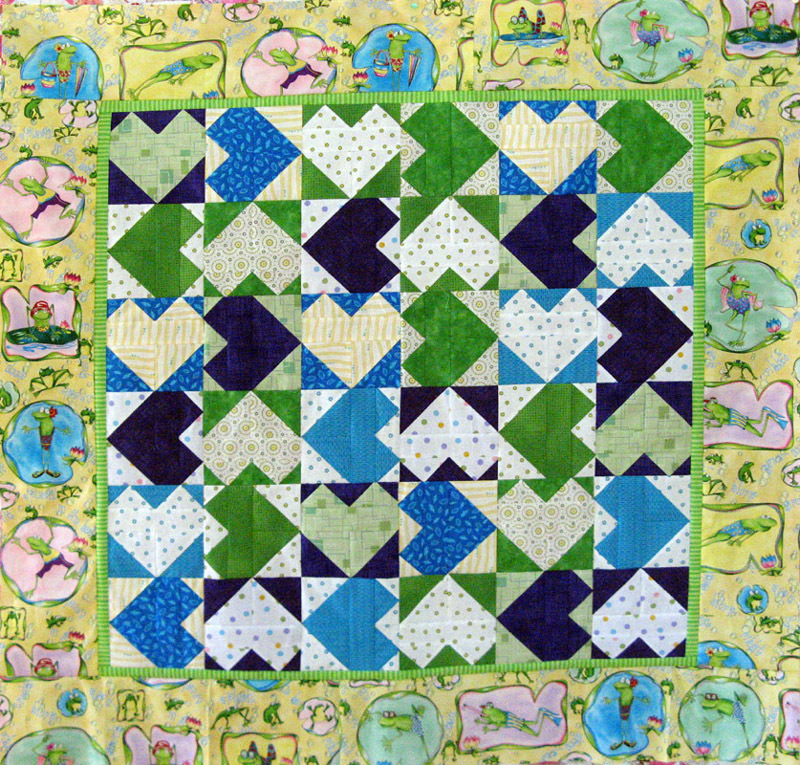 This is my January 2012 #5 UFO with Patchwork Times. Komplikated (Bonnie Hunter's Patches and Pinwheels) is ready to assemble. This is a 2011 UFO. Kordova Klosure (Bonnie Hunter's Orca Bay) is at Part 7. Korabell and her three kitties (JoAnn Mullaly's Mama Cat) is no further along since what was done in the workshop that was in October last year. Kartwheels (Judy Niemeyer's Mariner's Star) hasn't been touched since May 2011. This one is a 2011 UFO. It is sort of on hold until I decide what to do with the center melons. Not excited with what I have at the moment. 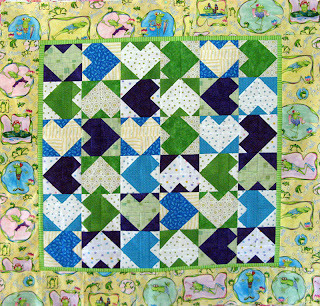 Another January 2012 UFO is with Jo's Country Junction from Quilt Squares #1, the log cabin quilt. 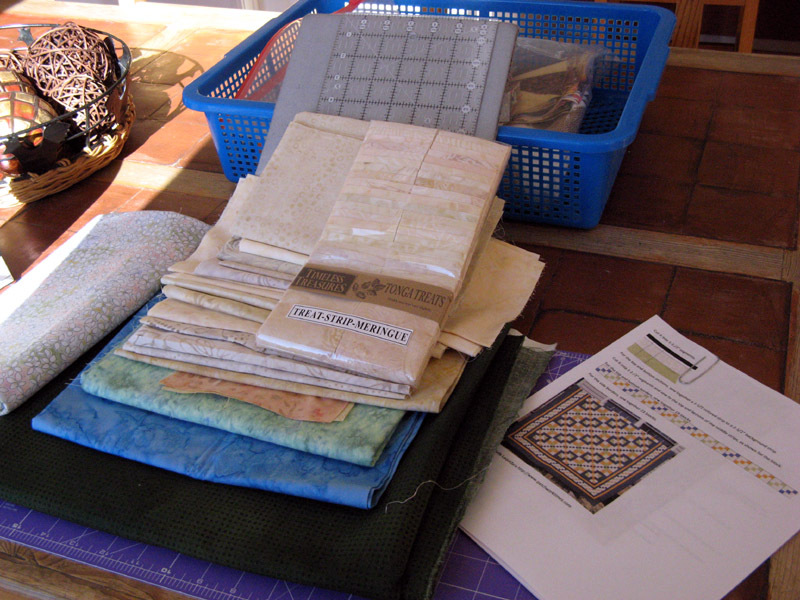 It is a 12" x 12" project that once going won't take long to finish. Finally two new projects to cut for in the next couple of days. Yes it is crazy cutting out more when all the ones I've already mentioned aren't done! 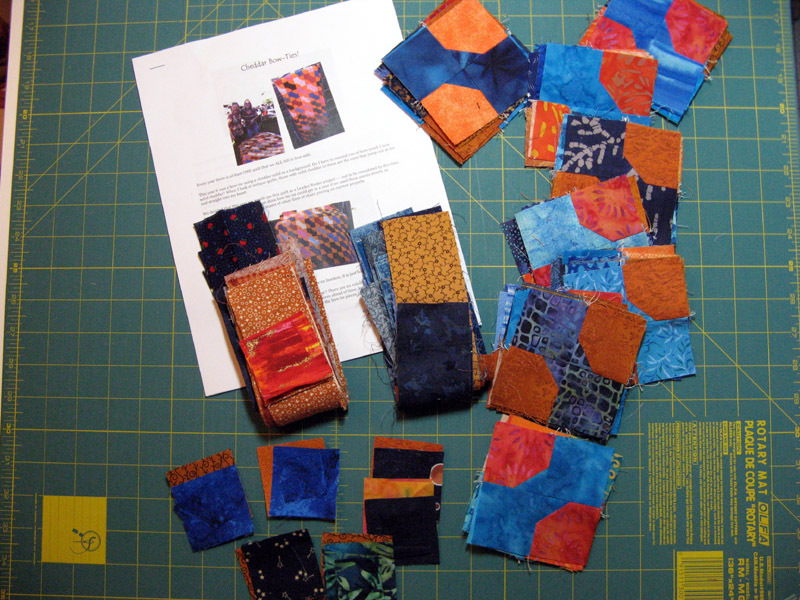 I'm taking two workshops at Road to California Quilt Show this weekend. The first is Scrappy Layered Log Cabin with Karen Eckmeier; the second is a mystery with Tracey Brookshier on Friday night. I'll show you what fabrics come from my stash later this week. If you have more time look at other Quilter's Design Walls via Patchwork Times. I've been busy all day at my sewing machine. 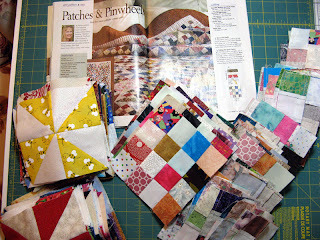 I am working on my 2012 January UFO #5 with Patchwork Times. So much on my sewing table these past few weeks I'm surprised I'm able to keep it all straight. It was the perfect day to stay in since I am fighting a cold and it was drizzling on and off all day. Judy Laquidara offers this pattern free on her website. 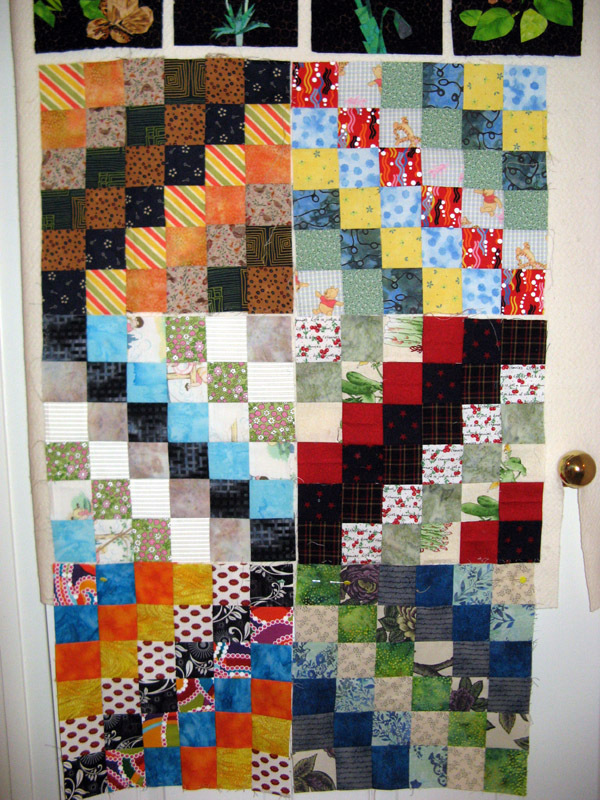 It was a quilt along that I knew I wanted to make but timing wasn't right to do it when it was first offered. It is called Connect the Dots. I will be calling my project Kontinuum. I have the first two clues complete and the cutting for the first four steps done on Clue 3. It should go together pretty good the rest of the way. This week I went to Rosie's with my house guest for four days, Bonnie Hunter. She hadn't been to Rosie's before and I knew she'd enjoy the stop. I didn't purchase as much from the SALE room as she did, but my Cheddar Bow-Ties are going to need borders and a back. I think this three yard piece will do just the trick for one of them. My report for this week is the first add of the year...darn it! Still can't claim anything used...something I need to correct soon. 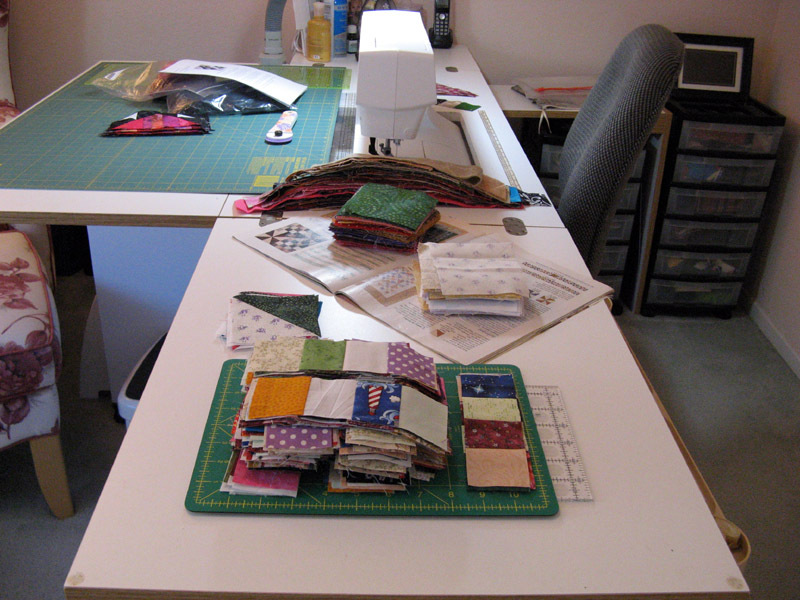 Sunday brought little time in my sewing room. I was spending time getting ready for my special guest, Bonnie Hunter, who arrives tomorrow. I will be her host for a few days while she lectures and teaches in the Southern California area. 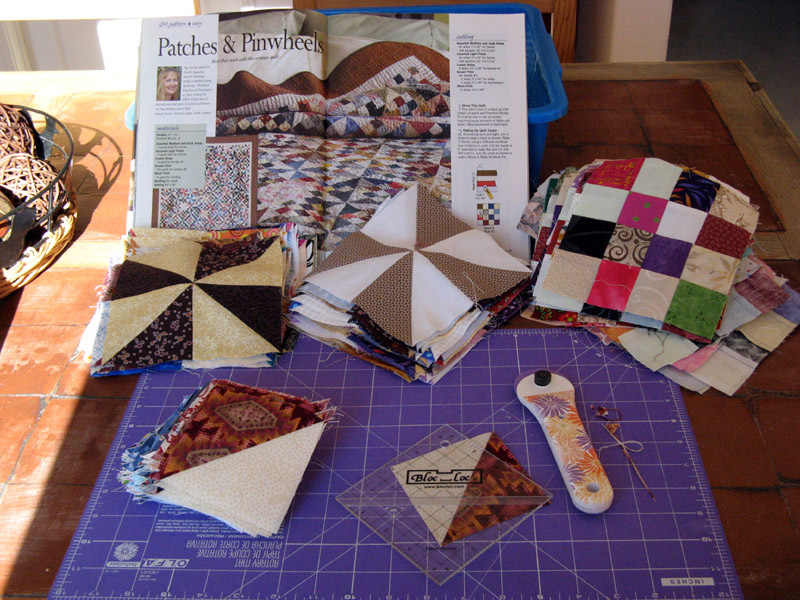 I did manage an hour in the morning squaring up the final pinwheel blocks and then just before bed another hour sewing them together. I have all the units ready to assemble on this 2011 UFO. I am feeling real good about being able to report some fabric being used next week! I have also gotten this far on my Cheddar Bow-Ties. I will admit that I have not been assembling these cute little bow-ties as leaders and enders. I use what ever project I am working on as my leaders and enders. My bow-ties are coming together between projects. You will notice that I have a lot ready to go for the next opportunity. 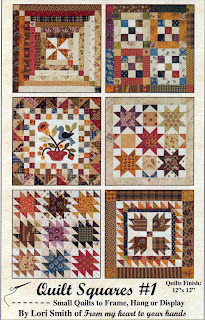 Tuesday night is Bonnie's lecture at Sunshine Quilt Guild in El Cajon. This is followed the next day at Memory Lane Quilt Shop also in El Cajon for a workshop on Scrappy Trips Around the World. I am ready with 120 strips of lights, mediums, and darks. I also have some extra strips if someone wants to trade. I sure hope we can get far along on this project during our 10 to 4 day of sewing. I'm certain we'll all have a great time. 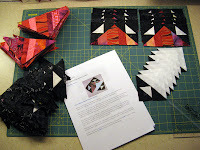 Wednesday night there is another lecture for Bonnie at Chula Vista Quilt Guild. 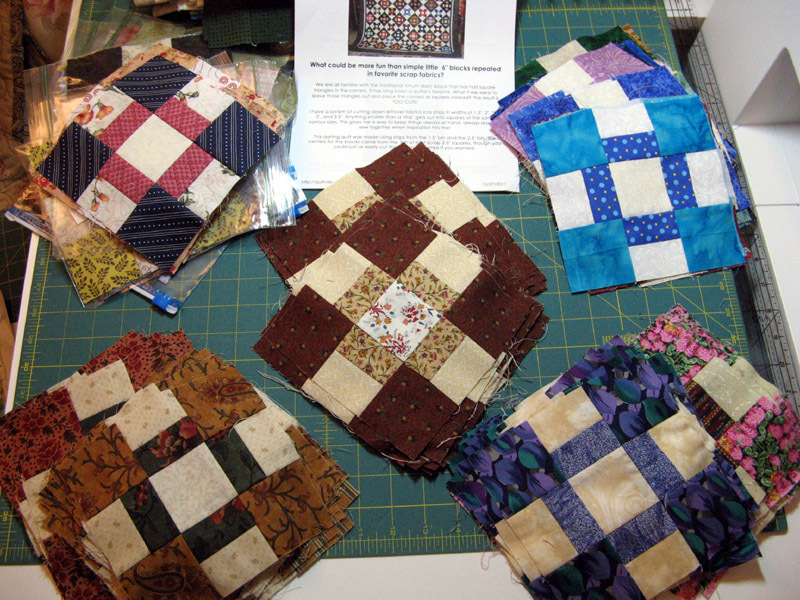 Thursday she heads north to Beach Cities and Friendship Square Quilt Guilds. She's one busy gal! See other terrific projects in the making at Patchwork Times. Second report of the year and still nothing to show used...of course the better side of this is nothing to reveal as purchased! I continue to work on the many projects that I've found myself started in of late. Unfortunately I'm starting yet more. I'm usually a one project at a time sewer and really do prefer it that way. Just sometimes it happens and I'm feeling overwhelmed. All will get done I tell myself...just not all at the same time. So here is the one I'm most diligently trying to finish. Komplikated! 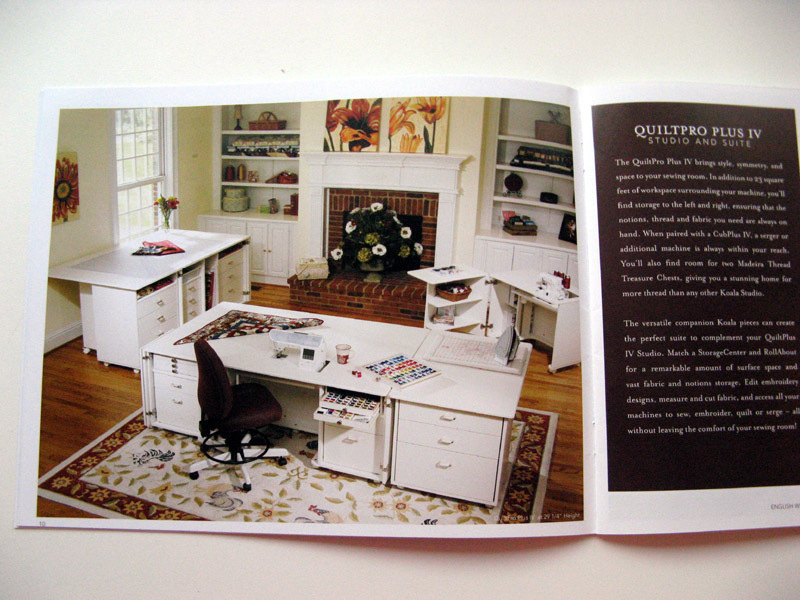 A Bonnie Hunter design that appeared in the Quiltmaker Magazine issue Sep/Oct 08. Mine is a true stash buster. It will consume quite a bit of fabric (yes I've been saying this for awhile). I'm getting ever closer to assembly. I'm using my Bloc-Loc ruler to square up the last 23 pinwheel blocks right now. Some of these will be assembled in both directions; note that some go one way and the other group spins counterclockwise. I'm working on having somewhere close to the same amount of pinwheel color in each group. 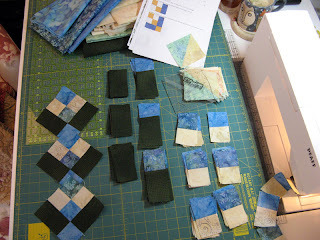 I've got pressing to do on the 12-patch blocks, however no more to sew on these. Next step ASSEMBLY on this delinquent 2011 UFO! I've also got my #5 2012 UFO fabrics figured out. 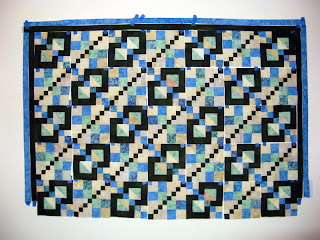 Went through my stash and found this rich dark green that's plenty enough for the dark blue that Judy Laquidara uses in her Connect the Dots design. This pattern is available on her FREE tab on her website. I am determined to get this one going and done in January 2012! Kontinuum is the name I've selected for this project. 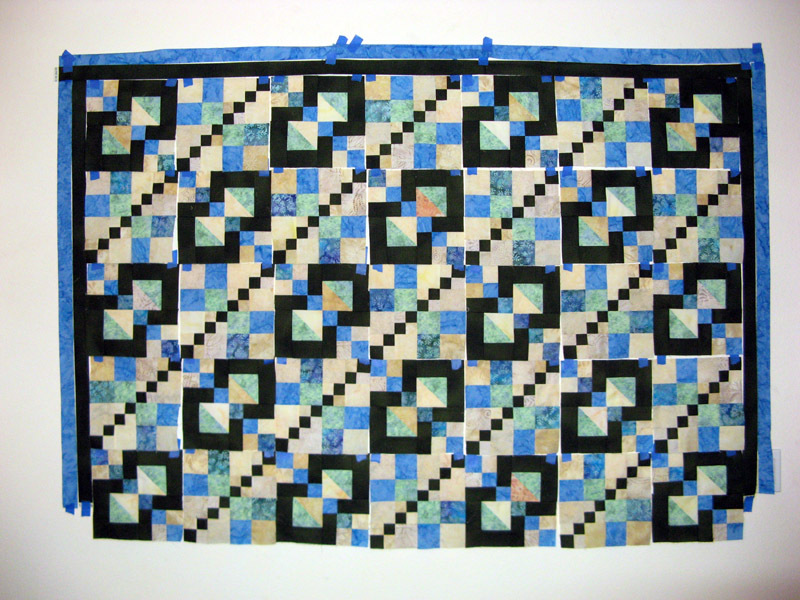 I think the blue and the green/blue will look well as the tan and gold that's in Judy's quilt. The various neutral batiks will be used as the background. 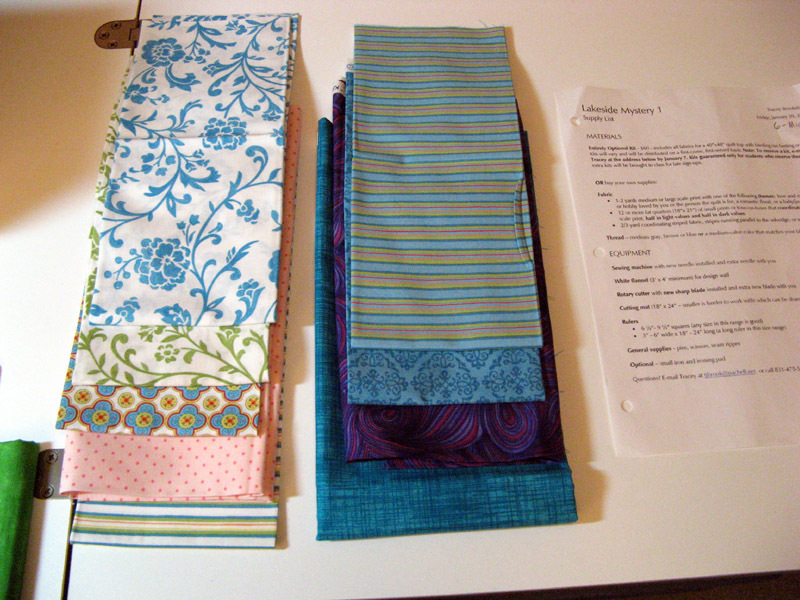 There are 4 fabrics in this project. 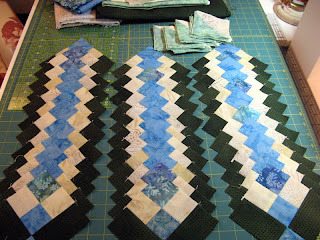 I will probably stop after Judy's 5th border using that color, which will be my green as the binding. I'll be sharing where I am with the other started projects tomorrow. Use up your stash! See other reports via Patchwork Times. I have some progress to show on Komplikated. This is a 2011 UFO. 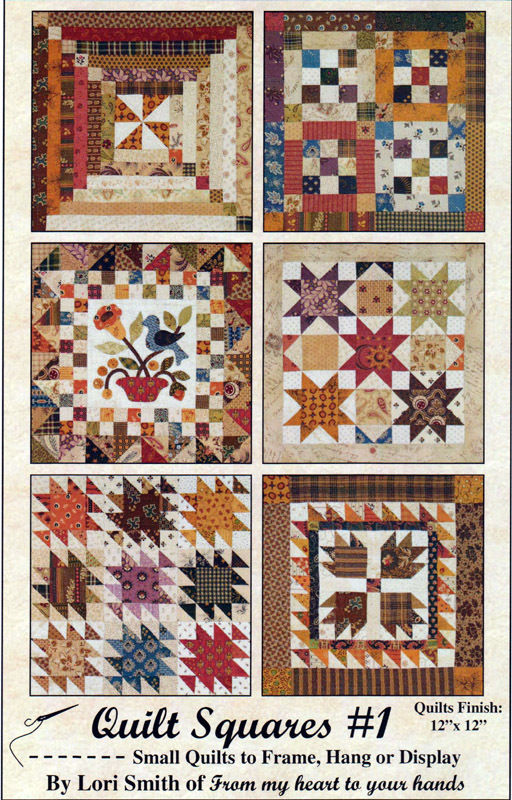 (Bonnie Hunter's Patches and Pinwheels design.) I've been working at it most of the day...my last day of holiday time off...:(! Yep its time to go back to work. Sure has been wonderful being off. 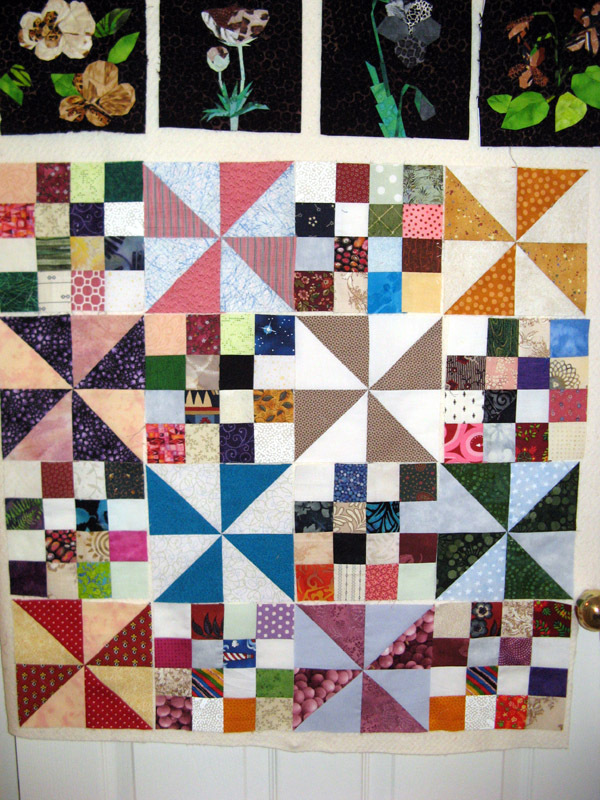 I've got many of the pinwheel blocks done and about as much of the 12-patches. I'm really giving my Pfaff a workout these past few days. Next up is Kordova Klosure. (Bonnie Hunter's Orca Bay.) This one the last parts have been released nearly on top of one another. I was caught up until Part 8 was released just two days after Part 7. I'm still working on Part 7...loving it! 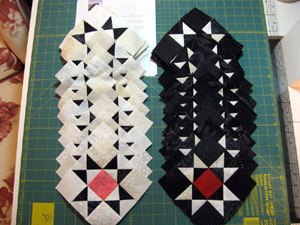 I've got a bunch more neutral triangles to cut still not to mention sewing on both of the pieces this Part has us doing. Then just to see how it's going to look I put together Part 8 with as many pieces as I have assembled so far and OH MY GOSH! 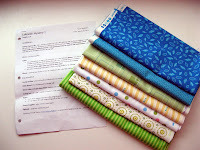 Kordova Klosure is going to be one fabulous quilt. Next Wednesday I'll be taking a workshop with Bonnie Hunter at Memory Lane in El Cajon, CA. We'll be making Scrappy Trips Around the World. I'll be hosting Bonnie for a few nights while she's in the Southern California area. 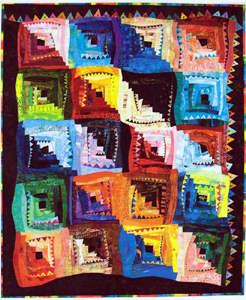 First up is Sunshine Quilt Guild on Tuesday evening followed by Chula Vista Quilt Guild on Wednesday evening. Then it's up yo Mission Viego for Beach Cities Quilt Guild on Thursday evening where she'll be through Saturday. She's going even further north to another guild before she leaves the area. I'm so looking forward to attending next Wednesday's workshop. I'll be busy this weekend pulling a variety of lights, mediums and dark 2 1/2" strips. Not to mention thinking about a "K" name for this one! The first 2012 UFO Challenge has been selected by Judy at Patchwork Times. It's #5! This one is a Judy Laquardia design called Connect the Dots. I love her borders. I don't have it yet in my hands but her book just released is full of border designs. I can't wait to see the collection she's assembled. She's so clever in her designs. 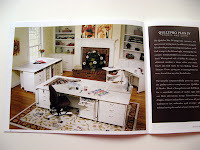 You'll be noticing that I've got lots of her designs in my UFO list for 2012. I will need to decide which fabric tote pan is most overflowing... I'll be calling my project Kontinuum. Hope today has pleasant weather and lots of time doing what YOU want to do. Today I'm not doing what I want quite yet. I'm taking down all the holiday decorations and laundry. 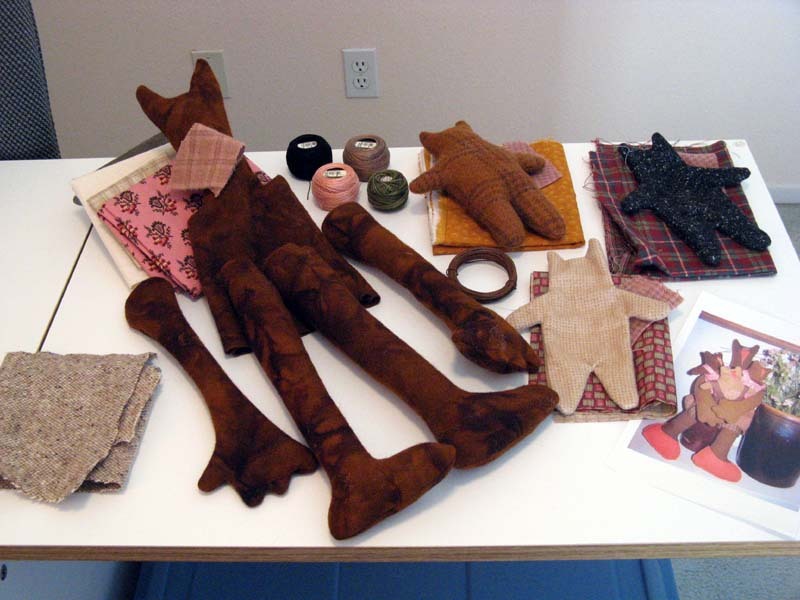 I'm far along now; hoping to be done soon so that I can get to my sewing room. Kordova Klosure and Komplikated have my attention right now. You can see both projects on my sewing table. Both of these are Bonnie Hunter designs. Kordova Klosure is Bonnie's Orca Bay is an 8 part mystery that started mid November last year. Pattern is available on her website right now. The reveal was today and what a beauty she's designed for us with this one. Part 7 is where I'm currently working on. It's sitting on the left just behind my sewing machine. It will use about 15 yards for top/back/binding. 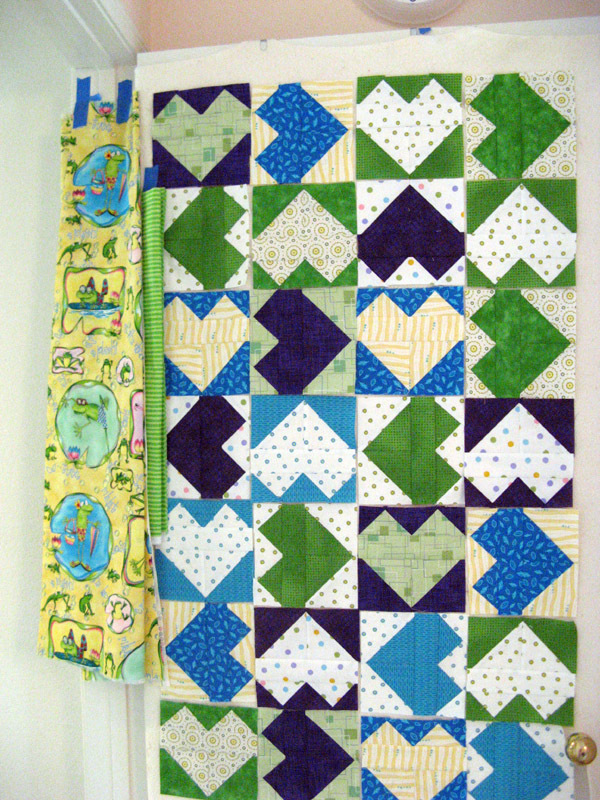 Komplikated is Bonnie's Patches and Pinwheels from a pattern in the Quiltmaker Sep/Oct 08 issue. 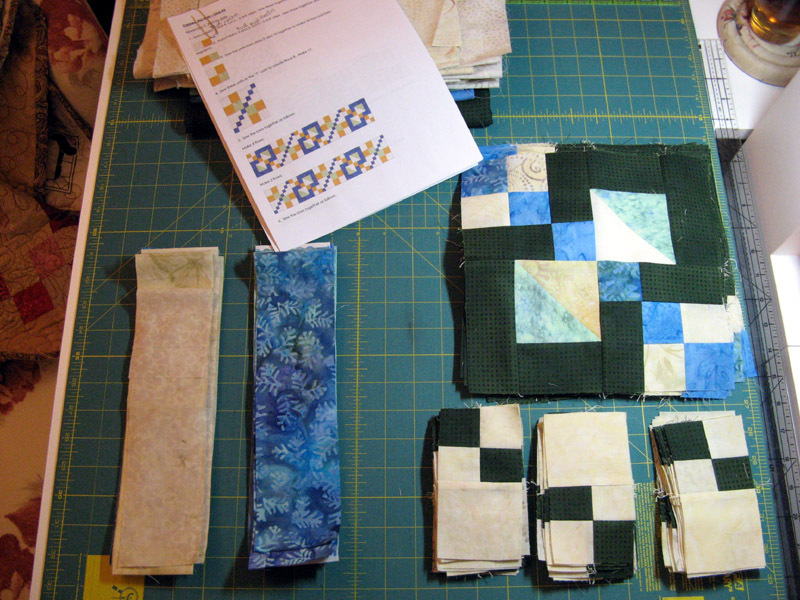 I've got about half of the 12-patch blocks made; its the pieces in the stack at the front. You can see by the machine is more 2" strips for the other half. I haven't done too much yet with the HSTs. It will use about 21 yards for top/back/binding. For now I start with all zeros! But you can see that my report's about to change. See other quilters as they use there stash throughout 2012 at Patchwork Times.